This week I continue with my "Start to Finish Story Time," series, where I provide a "start to finish" lesson plan for a sign language story time program for each of the themes covered in my "Story Time with Signs & Rhymes" books. This week's post provides a lesson plan for the theme, "Alphabet," using the book, "A to Z Sign With Me." I love exposing children of all ages to the alphabet handshapes. It's a soothing distraction for babies (parents: try signing the alphabet when you're waiting with your baby in the grocery store line instead of jingling your keys--babies love it!). It's also a great way to help children exercise their fine motor muscles (which is helpful for pencil practice! ), it builds letter knowledge, and it gives kids a tool to enable them say just about anything they want to say in American Sign Language, because even if you don't know the ASL sign for a word, you can always fingerspell it! As I explained last time, my aim is to build each lesson plan in a pick-and-choose/modular format, meaning that you can apply the elements that work for your environment, age group(s) and personal interests, and skip the rest. Each lesson plan incorporates ideas that are suitable for infant/toddler, preschool and/or school age audiences, and each program incorporates activities that promote literacy/early literacy and one or more of the six keys skills recommended by the National Research Council for preparing children to become readers when they enter school. Programs can last from 20 - 45 minutes, depending on what you include and who your audience is. *I like to open with The Alphabet Song (which is essentially the melody to "Twinkle, Twinkle Little Star"). I sing it relatively slowly, so everyone can follow along and make the alphabet handshapes. Depending on the age and attention span of the kids, I might review this two or three (or more!) times. NOTE: Even a baby, situated on his or her back, will enjoy listening to this melody and watching his or her loving caregiver sign from overhead...it's like a human mobile! *I find that it is more fun to introduce the signs by singing vs. simply showing the signs and asking participants to sign along/practice with you. (Click here for links to a series of past posts where I delve into the topic of singing and signing). 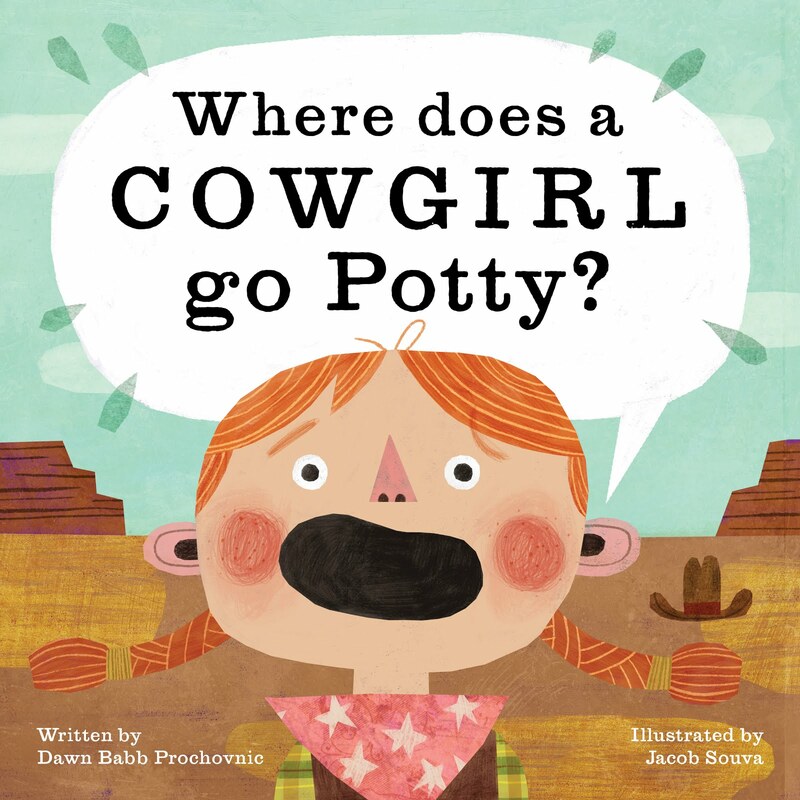 *Don't feel obligated to introduce/incorporate all of the alphabet handshapes the first time you share this book in a story time. Let your comfort level be your guide. At a minimum, introduce the first several letters of the alphabet (or the key letters you have studied thus far in class). The glossary on pages 31 and 32 of "A to Z Sign with Me" has detailed instructions for how to make each sign, or you can download the glossary from my publisher by clicking here (scroll down past the Star Wars Event info, and choose the glossary for Set 2). You can also refer to an online resource such as ASL University/Lifeprint or Signing Time. (NOTE: Just as there are variations in the ways in which people write letters and there are variations in typed fonts, so too are there variations in the ways in which ASL handshapes are made for the different letters in the alphabet. Don't let that stump you or your kids. Choose a trusted resource to find your signs/handshapes, and know that the variation you are using is one acceptable way to make the handshape). 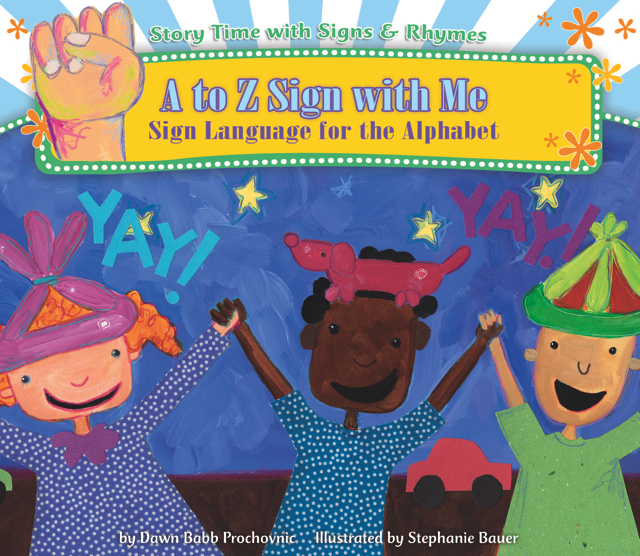 Read (or sing) the "Story Time with Signs & Rhymes" Story: "A to Z Sign with Me," by Dawn Babb Prochovnic, Illustrated by Stephanie Bauer. *Before you begin reading, invite children (and/or their grown ups) to listen for the words in the story that start with each letter of the alphabet, and show the letter sign when they hear the appropriate word. This story is a unique approach to an alphabet book in that it is a story about going to a carnival, but featured words beginning with the letters A to Z are incorporated in sequential order (i.e. "Eat frankfurters while they're good and hot."). NOTE: "A to Z Sign with Me" can be sung (loosely) to the tune of The Alphabet Song/Twinkle, Twinkle Little Star, but you have to repeat the melody again before the story is complete. I tend to save singing this story for older and/or more experienced kids (or for a subsequent reading), re: I like to be able to take my time with the story. For example, as the children see the pattern of the alphabet emerging from the story, I like to build narrative skills and invite them to predict what might come on the next page. *Invite kids and their grown-ups to get up and dance to the music and do the signs for the the alphabet when they hear the letters in the lyrics (and when they see you signing). *Choose one or several of the options below to fit your participant age/attention span and program time available. *In classroom or homeschool settings, these learning activities can be incorporated at different times during the day or even over several days. *In library settings, different activities can be incorporated for different age groups of participants (i.e. All groups start with the basics above, but for the infant/toddler group, add another song or two and wrap it up; for the preschool group, add another story, some songs and/or music, and a game or a craft; for the school aged group, add a couple more stories, some songs and/or music, a game or two, some fun facts, and a craft). Using the easel as a visual tool, I recite the story again, pointing to, and signing along with the letter for each alphabet word featured in the story. Kids really get a kick out of joining in on this! Chicka Chicka Boom Boom and Dr. Suess's ABC. Two other ABC books I would highly recommend are Lora Heller's Sign Language ABC and Nellie Edge's ABC Phonics (which has a companion musical CD, and is available from Nellie's website, which is packed with resources for building literacy skills). *"If You Sign and You Know it, Show Me A/B/C, etc" sung to tune of "If You're Happy and You Know It." (i.e. "If you sign and you know, show me "A." If you sign and you know it, show me "B." If you sign and you know it, show me "C." Really show it. If you sign and you know it, show me "A-B-C."). This song is really good practice, because in the subsequent verses, you need to start in the middle of the alphabet (with D, E, F, and G, H, I, etc). I like to have a cheat sheet of the actual alphabet within view, to help me stay on track! *"Do You Know the Sign For A/B/C?" sung to the tune of "London Bridge." (i.e. "Do you know the sign for "A," sign for "B," sign for "C?" Do you know your "A-B-C's?" Show me ____.") This song is especially fun, because you can turn it into a game by asking kids to show you the sign for the letter that you say for the "blank" at the end. *"Mary's Name begins with "M" sung to the tune of "London Bridge." (i.e. Mary's name begins with "M," begins with "M," begins with "M." Mary's name begins with "M." Let's sign "M." NOTE: I would not do this song and the one before it during the same session because they use the same melody, but this is an especially good literacy activity for children ages preschool and up." *"Find the Letter "K," sung to the tune of "The Farmer and the Dell." (i.e. "Find the letter "K." Find the letter "K." Hi Ho the Derry O, you found the letter "K!""). This is a great activity to build print awareness. 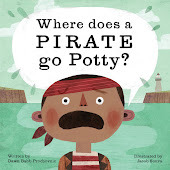 Invite younger kids to search for letters from an alphabet listing you have posted in your classroom or library story time area (I know you have one of these!). For older kids, invite them to find the featured letter anywhere in the room (on a sign, in a book, on a name tag), and for even older kids, you can invite them to find a person or object that begins with the featured letter. Repeat this for several different letters based on time/attention span available. (An alternative that can be fun for preschool aged children is to ask the children to close their eyes (they will peek...it's okay) and then "hide" a block with a featured letter under a blanket in the center of the circle. Preschoolers get an absolute thrill out of being able to anticipate and predict where the "letter B" is "hidden" time and time again (and yes, as I've mentioned before, I hide each object in the same place each time--the kids can barely contain themselves by about the third round of play). *Have an alphabet "cake walk." Set out foamy alphabet letters (or even pieces of paper with a different alphabet letter on each page taped to the floor will work). Play music and instruct participants to move around the circle. When the music stops, each participant should stop near an alphabet letter. Select a letter that is represented in the circle and say (and/or show the sign for) that letter. Anyone who is standing on/near that letter (and who can make the correct sign for that letter) wins a prize. To provide an additional stretch for older kids, you can require them to fingerspell their name to win a prize instead of just signing the letter they are standing on. *Sign Language Memory Game. Have participants stand in a circle. The first person begins by saying, "My name is _____ and that starts with the letter ______" (using the alphabet sign for the letter their name begins with). The second person in the circle continues, "My name is ______ and I know the sign for the letters ______ and _______" (repeating the first letter and adding the first letter in their own name). The third person continues, "My name is _____, and I know the sign for the letters ______, _______, and _______," (repeating the first two letters and adding the first letter in their own name), and so forth. A new round begins when someone cannot remember the string of letters in the correct order. *Fun, online fingerspelling games from Lifeprint/ASL University can be found here and here. *Sign Language Wiggle Buster: Have participants stand up. Call out for participants to engage in different movements based on the letters in their name. For example, "If your name begins with the letter "B," put your hand on your head." "If you have the letter "A" anywhere in your name, hop up and down three times." "If you have a double set of letters in your name, spin in a circle." "If you have more than three letters in your name, sit down." Use the signs for the letters you refer to during the game. This is a great activity to get the wiggles out. For younger kids, it's helpful for them to have an index card with their name on it that that they can check to see if their name "qualifies" for the particular action being called out. 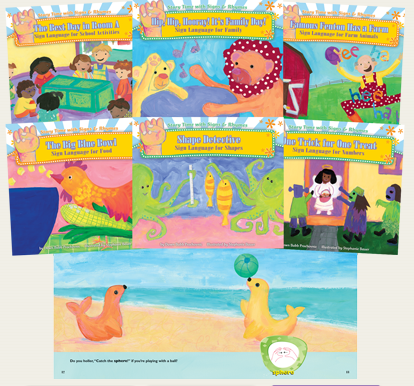 NOTE: Instructions for several other signing games are included in each book in the "Story Time with Signs & Rhymes" series. Instructions for "Alphabet Circle Game," "Alphabet Song," and "Alphabet Guessing Game" are offered on page 31 of "A to Z Sign with Me." *There are fun facts about ASL included on page 30 in each "Story Time with Signs & Rhymes" book. Older kids particularly enjoy the fun facts, but even preschoolers, and the parents of infants/toddlers enjoy learning about ASL and/or Deaf Culture in addition to learning key signs. *A fun fact I like to point out during the "Alphabet" theme is that although there are ASL signs for many English words, some words do not have a sign. These words are fingerspelled. Once you learn to sign the alphabet, you can fingerspell any word you want to say in sign language (even if there is an ASL sign for the word). *Encourage participants to make their own "Alphabet" book. Give each participant 4 sheets of paper. Stack the paper, and fold it in half to make a "book" that will be 8 pages. Ask kids to choose their "8 favorite letters." Offer art supplies and instructions to create one alphabet letter-themed illustration per page. Alphabet stickers are a great hit, too! Encourage participants to read and sign their book to a partner. -Print out several copies of the free ASL glossaries and alphabet games/activities (for younger kids or for older kids) from my publisher's website. Invite children to cut out the letters/handshapes in their name, and paste those on a piece of paper or on a series of index cards. You can also make several sets of letter handshape flashcards ahead of time using the glossary and blank index cards. Kids can see how many different words they can spell with a deck of cards. 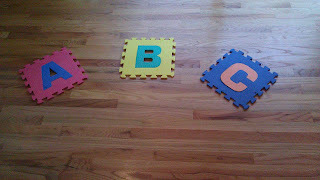 *Put out alphabet blocks or magnets for free play, and/or encourage kids to make words with the magnets or letters on the blocks. 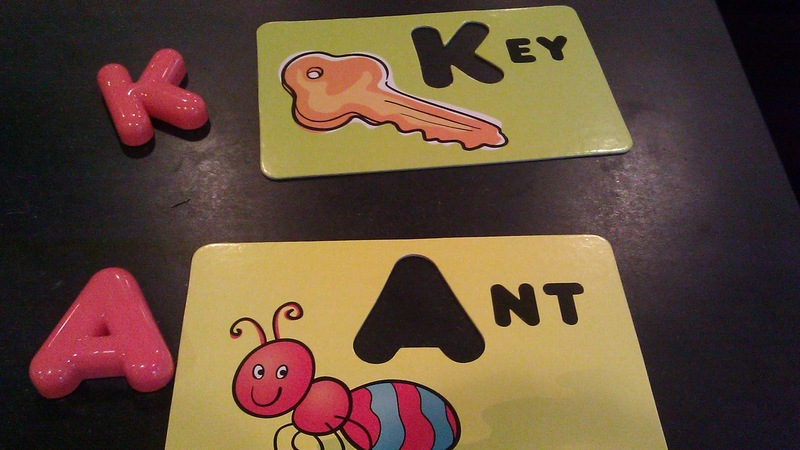 * Make sets of alphabet flash cards as described above or use ready-made cards. 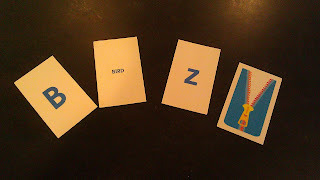 Encourage participants to spell words with the cards, or invite them to play matching games like "Concentration" or "Go Fish" using the cards. Add a rule that the appropriate letter must be signed before you can keep your "matches' and/or to obtain a requested letter in "Go Fish." NOTE: For parent/child programs, I prepare instruction cards that go along with each set of cards/blocks so that parents can read the instructions (i.e. how to play "Concentration" or "Go Fish," so each parent/child pair can play independently or with other families in attendance). *For older kids (where choking is no longer a hazard), letter-based games such as Boggle and Scrabble can be enriched with sign language (i.e. 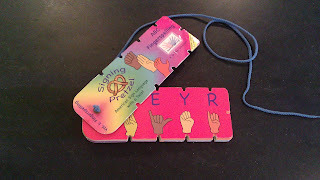 you don't get your points if you can't successfully sign/fingerspell the words you create! *The Signing Pretzel is a fun, independent activity for early elementary aged kids. *I typically close each story time with a song that reviews the signs we've learned during the program. This theme is no exception. I usually close this story time with the "Alphabet Song," which is the same song I open with. (I find it amazing how much more readily participants can make the signs, and they seem pretty impressed with themselves, too!). I usually sing this song AFTER I've given instructions for the craft and/or free play activities (if I have these elements planned for the program), but BEFORE I let participants transition to the craft and/or free play activities. This wraps up another "Start to Finish Story Time." I hope this has been helpful, and I look forward to your input and ideas, which I will incorporate into future posts. If you are planning your own Sign Language Story Time event, be sure to check out the great resources my publisher has developed to help you plan your own event (scroll down past the Star Wars Event Info). If you love the ideas I've shared, but would prefer that I deliver the Sign Language Story Time to your students or patrons, invite me to your school or library, or ask me about Skype visits!